In the toy car world, these wooden marvels would have to be among the most handsome vehicles on the planet. My sons play with toy cars for the greater part of most days. Making roads, ramps and tunnels takes up the greater part of my days. It fuels their imaginations and mine – and it intrigues me just how absorbed in car play children can become. There are a handful of cars in their collection that will become keepsakes, and if I get my hands on one of these beauties, you can bet it too would become an heirloom piece. 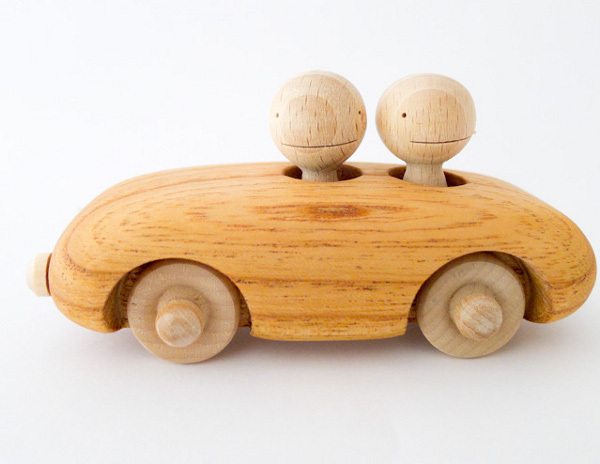 Kuruma (which means ‘car’ in Japanese) is a wooden car toy with loads of personality. How can an inanimate object have personality? Take a look at the video below to be taken on a Kuruma adventure – if nothing else, it’s certain to put a smile on your face! These cars are made by Mr Togawa – a wood artist and owner of the FLOWERS studio in Yakushima, Japan. He hand carves the cars and their gorgeous little passengers. This unique artisan uses different wood grains, which ensures no two cars are alike. And to inject even more charm into these toys, the passengers wobble as the cars go on their merry way. Baum-Kuchen has cars in camphor, Chinaberry and mountain cherry, currently in stock. The cars are US$58, with shipping to Australia priced at US$11.99.